We are pleased to offer this added convenience to our customers. We want to keep you up-to-date every step of the way during the repair process. We send an email to you as each step is completed. We also have your vehicle status available to your insurance company and rental car company. To protect your privacy you will be given a Log-in ID and a password when you leave your vehicle for repairs. We'll take care of the rest. Computerized estimating has taken the guess work out of auto damage appraising. We are able to provide you and your insurance company with an estimate that reflects each step needed to repair your vehicle to pre-accident condition. This estimate is based on visible damage and is honored by all insurance companies as fair and accurate. Automobiles have come a long way over the years and so has the process of repairing them. Safety issues are a major concern to you and especially to us. The key to restoring your vehicle is to insure that the structural integrity of your vehicle is restored to factory specifications. The factory that built your vehicle measures in milimeters and so do we. 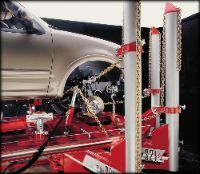 That's why we use computerized measuring equipment built by the best in the business, Chief Automotive. Why drive your vehicle when it isn't safe? Don't take chances. We recommend you call the Tow Pros! (858) 486-6622. They are available 24 hours a day, 7 days a week and se habla español. Is your car sitting in a tow yard somewhere? We can help you with that too. Just give us a call and we'll send the Pros to get it for you. We'll also bill your insurance company for you so you won't have to worry about it. For the best professional mobile detail service in San Diego County, call Tommy Trozera 619-995-8005 at Black Forest Polishing Systems. He is not the cheapest but he is by far the best we have used here at Poway Valley Collision. The most visible step of the repair process is the final finish. We spray PPG products and mix them in-house using the factory formulas for your vehicle. We then process your vehicle through one of our 4 heated downdraft spray booths to bake on the finish. From primer to clearcoat, your paint is restored to its factory finish. 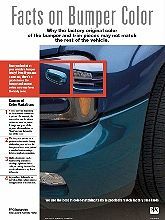 Click the graphic to review some facts that you should know regarding bumper colors on your vehicle. Contact us today to schedule a free estimate!